In the world of yard art, it's hard to imagine that there's anyone who doesn't immediately recognize the Travelocity garden gnome! 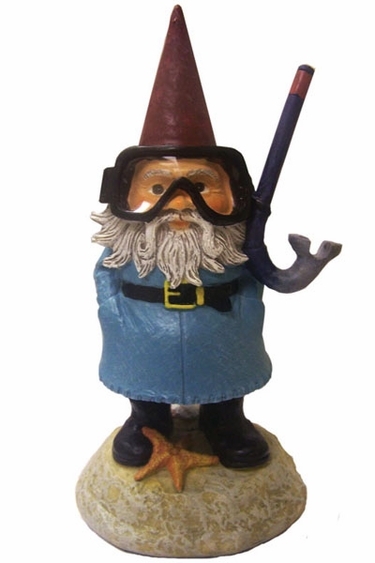 This charming travel companion, known officially as the "Roaming Gnome," is seen here in his classic blue overcoat, cone hat and snorkel gear. He's ready to dive right in to a fantastic journey. He's 9 inches tall and made with durable cast stone. In ancient mythology, gnomes were said to be masters of the earth with magical powers. What better garden decor than a creature who will guard your yard and stand sentry at your front door? At GardenFun.com, we have whimsical garden ornaments that will put a smile on everyone's face. Browse our pages for garden art such as wind chimes, wind spinners, and garden gnomes of all kinds. Size: 5" x 9 1/4" tall. Cast resin. Ready for his seaside vacation!